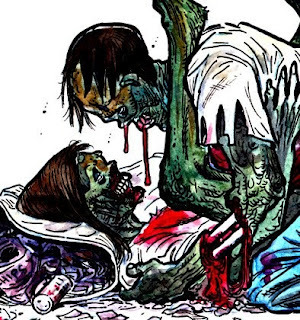 Can you get an STD from a Zombie? Posted on May 21, 2015 by OhMyBlog! Zombies and Syphilis – A Myth to Explain a Disease? Zombies have long been a fascination for Americans. From Night of the Living Dead to the Walking Dead to Dawn of the Dead, to Jane Austen and Zombies to Zombie Apocalypse, the zombie subculture is “alive” and kicking it in the millennium. Zombies have infiltrated everything from films to books to video games, cocktails, cartoons, and bands. Every October, Zombie Crawls are celebrated as people dress up as zombies in order to shuffle and stagger their way from bar to bar to drink zombies. This zombie phenomenon is not limited to Halloween. This spring, a 5K charity run is scheduled in which the runners have the added incentive to cross the finish line quickly as they will be chased by-you guessed it-zombies. Zombies are believed to have originated in the Haitian African-American culture. Fueled by macabre voodoo rituals, dark magic revived the dead to do the bidding of those who summoned them. These walking corpses shambled forward with a stilted gait. Flesh rotted away from their bodies, and their minds could no longer formulate rational thought. What does any of this have to do with sexually transmitted diseases? Good question. The answer may surprise you. In 1492, Europeans brought small pox, bubonic plague, venereal disease, and religion to the New World. The New World returned the favor with syphilis. Late stage, tertiary syphilis is syphilis that has not been treated. Spirochetes are wormlike microscopic organisms. Over the course of the disease, they multiply to the millions and lodge in most of the major organs including the brain. The human body becomes stooped and rapidly ages. Symptoms of late-stage syphilis include a jerky, stumbling step, large oozing sores, loss of tissue such as the end of the nose, and moments of euphoria followed by rage. In other words, late-stage syphilitics and zombies share many of the same traits. Zombies originated in the New World as did syphilis. Myths develop in order to explain the otherwise unexplainable. In this instance, the zombie myth developed in order to explain syphilis, an incurable and deadly disease in pre-penicillin days. While syphilis is now treatable, it took more than 450 years to find a cure. While the zombie myth may have arose as a way to explain a sickness, modern culture has embraced zombies. Michael Jackson’s,Thriller video of dancing zombies, remains the number one best-selling album of all time in the United States. In 2010, Asbury Park, New Jersey set the Guinness’ World Record Zombie Walk with an official 4,093 participants. There are many ways to get an STD, and if you get one, find a location for STD Testing in Philadelphia.